The omega-3 fatty acids found in fish oil are an essential part of a healthy diet. 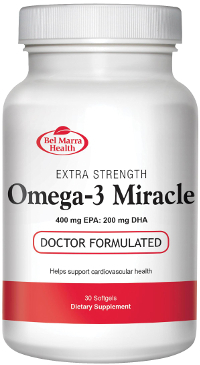 Omega-3 Miracle contains eicosapentaenoic acid (EPA) and docosahexaenoic acid (DHA), which are the two most important of the omega-3 fatty acids. Both of these essential fatty acids are often missing in the traditional Western diet. While it is possible for the body to produce EPA and DHA, it is far more effective to supplement with EPA and DHA directly. Omega-3 fatty acids are essential for supporting optimal health, and have been shown in clinical studies to have powerful benefits for cardiovascular health. Each Omega-3 Miracle soft gel contains 1,000 mg of fish oil, containing 400 mg of EPA and 200 mg of DHA. These high levels of EPA and DHA make the soft gels an excellent addition to a balanced diet for supporting cardiovascular health. DIRECTIONS Adults take 1 softgel daily, or as directed by a health care practitioner. Do not use if seal around cap is broken. WARNINGS Do not use if pregnant or nursing.